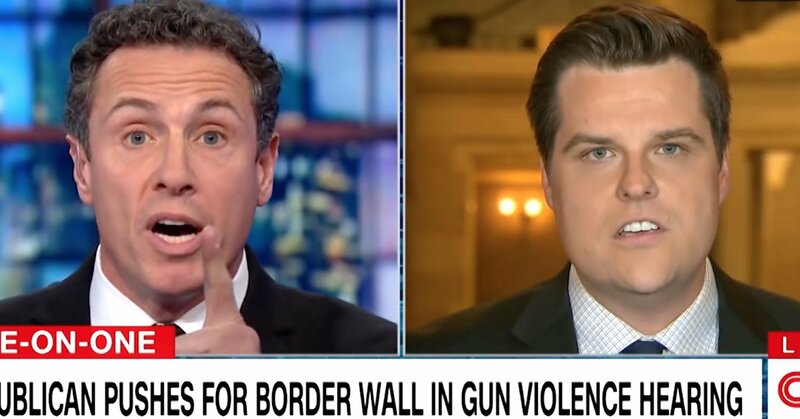 Chris Cuomo got into a heated debated with Rep. Matt Gaetz (R-Fla.) over gun control on Thursday night, one day after the lawmaker drew criticism for using a hearing on gun control to push for President Donald Trump’s proposed border wall. That didn’t sit well with the CNN host. Gaetz repeatedly blamed immigrants for crimes and insisted that building a wall would stop violent immigrants and reduce gun violence. Cuomo, however, called out the politicians who refuse to act and stop mass shootings. The two sparred over the wall and immigration for several minutes, with Cuomo accusing Gaetz of using crime committed by undocumented immigrants as an “article of convenience” to push Trump’s wall agenda. “You think that we are that craven?” Gaetz asked.